Nasi Lemak has always been simple comfort food for many people in Singapore and Malaysia. The dish which literally translates to ‘Rich (tasting) Rice’ features rice cooked in coconut milk giving the dish that lemak umami taste, paired with an equally delicious sambal sauce. Traditionally, Nasi Lemak has been ‘poor people food’. 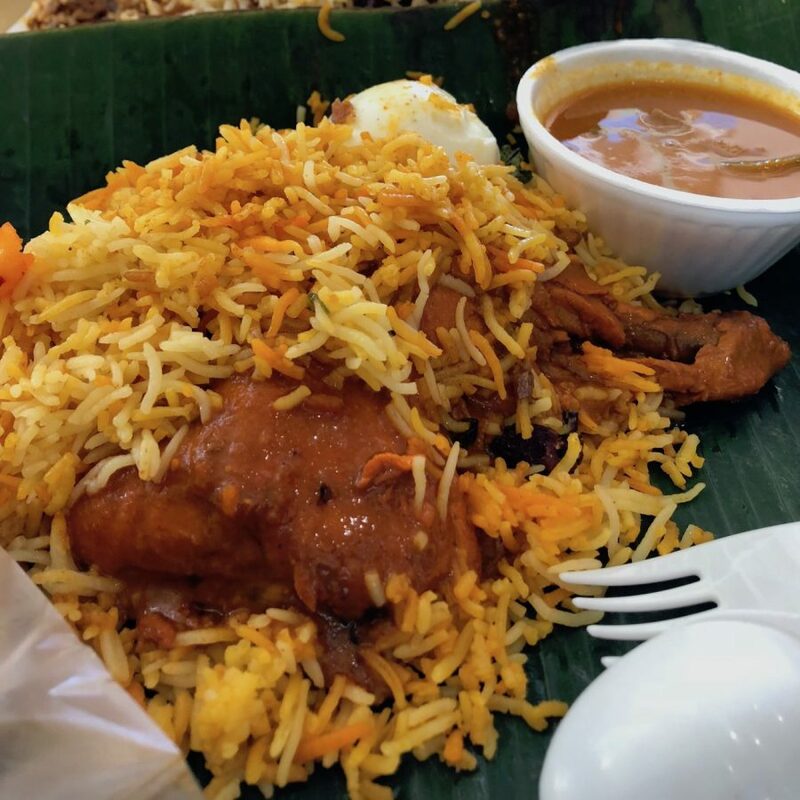 Back in the day, you could get a banana leaf wrapped Nasi Lemak for only a dollar, and it would have a mound of rice, peanuts, ikan billis (anchovies), a thin slice of omelette and sometimes a small deep-fried fish. That is, until the folks at Coconut Club decided to disrupt the Nasi Lemak scene in Singapore. 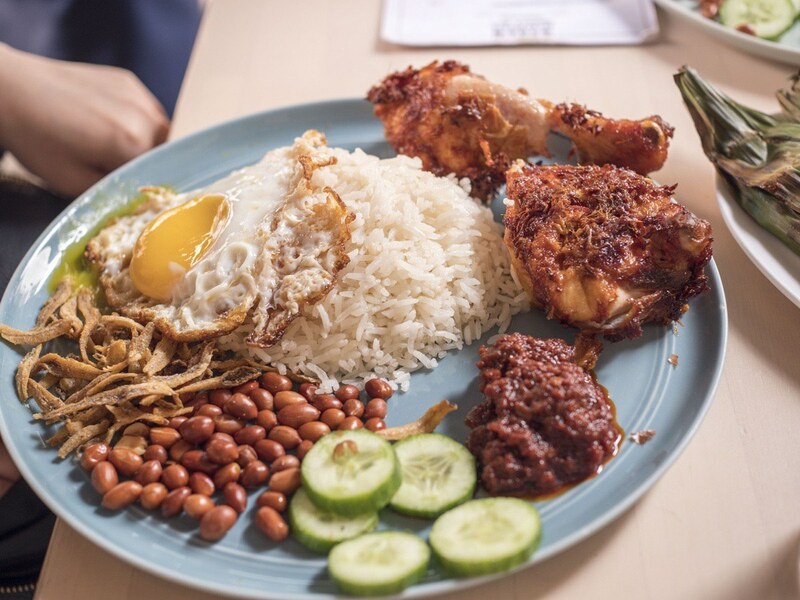 What’s so special about the Coconut Club’s Nasi Lemak? Firstly, to address the elephant in the room, a standard plate of Nasi Lemak at the Coconut Club costs $12.80. The founders of The Coconut Club reportedly spent two years scouring the orchards of Malaysia searching for Malaysia’s Top Coconut (Milk), after which they settled on the ‘MAWA’ strain of coconuts which stands for MAlaysian West African. What’s good to eat at The Coconut Club? 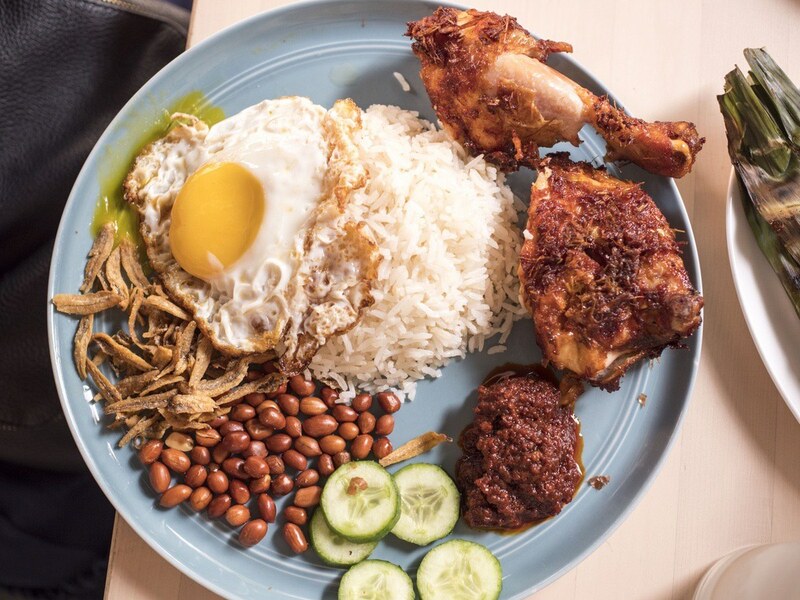 The coconut club prides themselves on doing two things, and two things really well — nasi lemak and chendol. 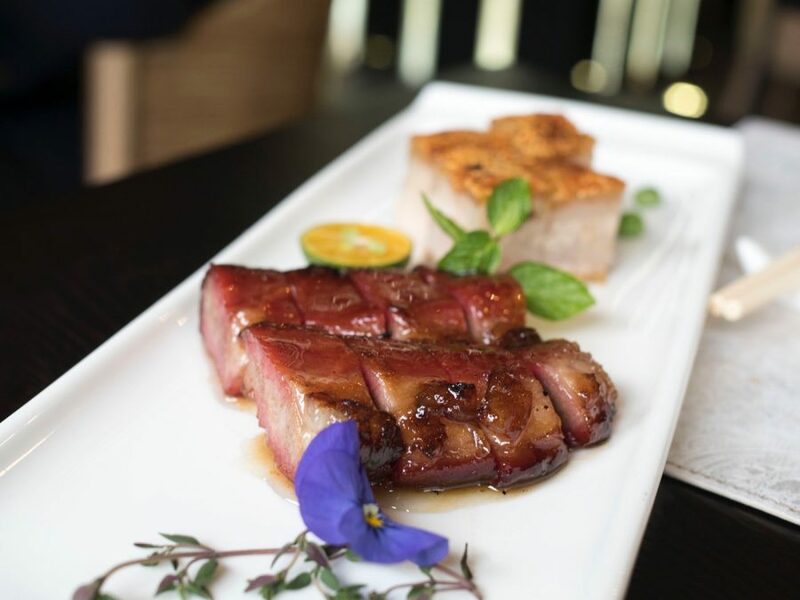 That said, throughout the two years that they had opened, they had slowly been introducing new items to satisfy our very picky Singaporean appetites. 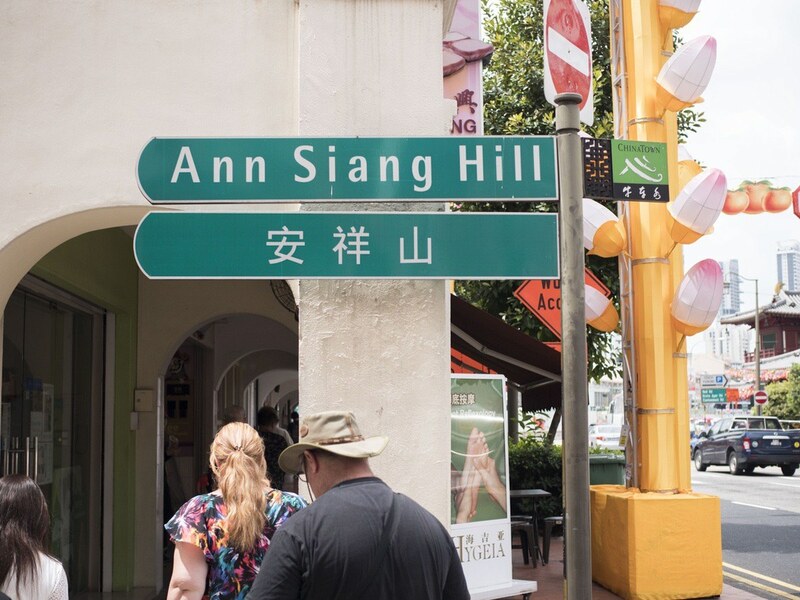 The Coconut Club is located on Ang Siang Hill, which houses a variety of hipster cafes and restaurants right off China Town. 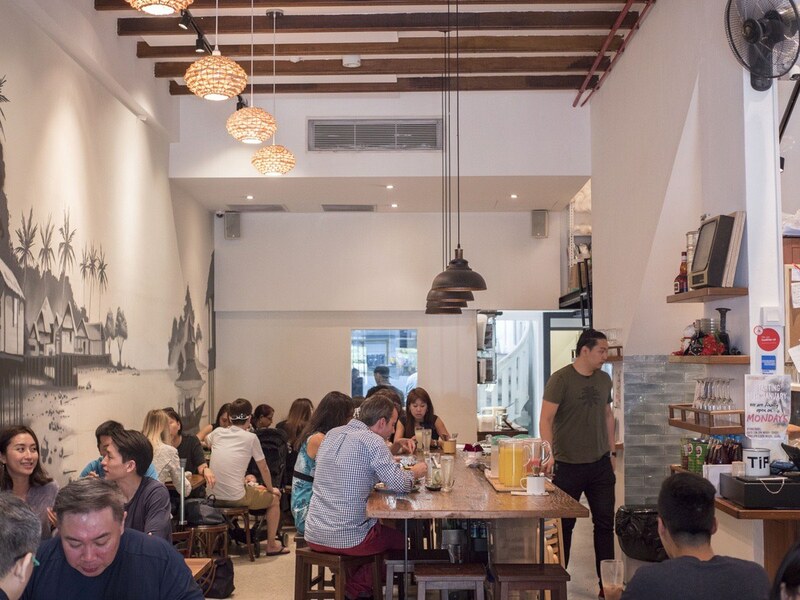 The restaurant itself is a refurbished cozy colonial-era shop house, with slightly cramped indoor seating and a handful of high tables outside. Groups are not allowed to be seated unless everyone in the group is present. The four of us chose to sit outside, which was a wise decision as it was more airy and less noisy compared to the tables indoors. There were only 2-3 servers attending to customers inside and outside of the restaurants, but I’m happy to report that they were very well trained, efficient and all smiles. Food came out very quickly, which was actually no surprise since Nasi Lemak is not something that is made to order, but rather assembled with pre-made components. 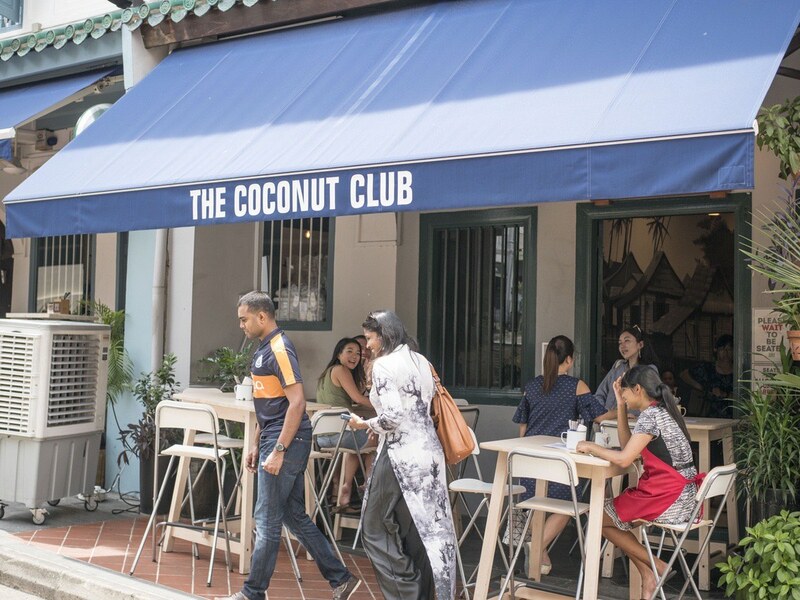 As it was our first time at The Coconut Club, we naturally went for their classic $12.80 Nasi Lemak and also their Otak Otak, a barbecued fish snack often had together with Nasi Lemak and finishing off the meal with a round of Chendols. The two redeeming factors of a good nasi lemak to me, are the rice and the sambal chilli. The rice should be fluffy (which simply means the rice isn’t sticking to each other like glutinous rice or overcooked wet rice) with a strong aroma of coconut milk and fortified with a hint of pandan. The rice should also be slightly seasoned so one would want to eat an entire plate of rice on it’s own. The sambal ought to be embodied with the fragrance of a hundred shallots, spicy but not overly so, with a hit of sweetness since it’s for Nasi Lemak. If there is one more thing that would make a Nasi Lemak a Nasi Lemak, it would be the crispy fried ikan bilis (anchovies) and peanuts. On paper, that sounds like a dreadfully dry meal. In reality, it’s a marvel of flavours and textures mashed together with every spoonful of rice. The sambal acts as the moisture and binding component. That said, if you do not take spicy foods and intend on omitting the chilli sauce, do not go for Nasi Lemak. The Nasi Lemak at The Coconut Club looked exceptional. It had all the components one would expect, beautifully and generously spread out on the large plate. The fried egg was done crispy style, just the way I like them for their crisp edges and charred egg whites flavour. The peanuts and ikan billis? Perfectly fried, crispy, well seasoned and a very generous serving. The sambal chilli, lovingly spicy and salty, though not as sweet as I had expected, but forgiven because it had tons of umami notes; I would guess from dried shrimp and hundreds of minced shallots. Onto the rice made with the fabled single-origin coconut milk. Would it be life changing? Will I never look at nasi lemaks the same way again? Would this be the one lemak to rule all nasii? Thankfully for our favourite mom and pop shops and regional nasi lemak leaders (Punggol, Changi, Chong Pang), they are still relevant in the scene. 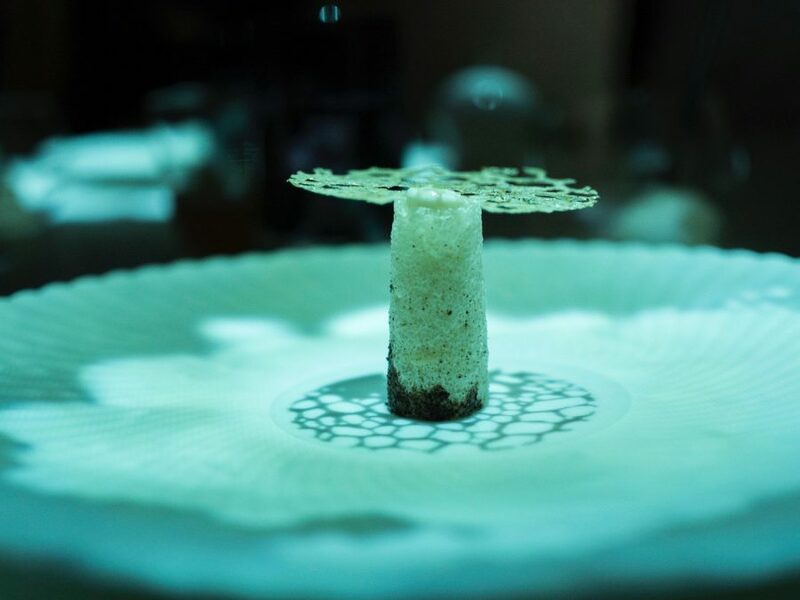 The rice at The Coconut Club was sadly not as impressive as I had hoped it would be. Mind you, it was a very well cooked plate of nasi lemak. The rice was text book perfect in it’s texture and taste. However, I had hoped for more than just a subtle coconut fragrance (I had also hoped for a little bit more rice). Which brings about a little debate which I will address later. The star of the plate however, was the fried chicken. The chicken was not the usual battered fried chicken. 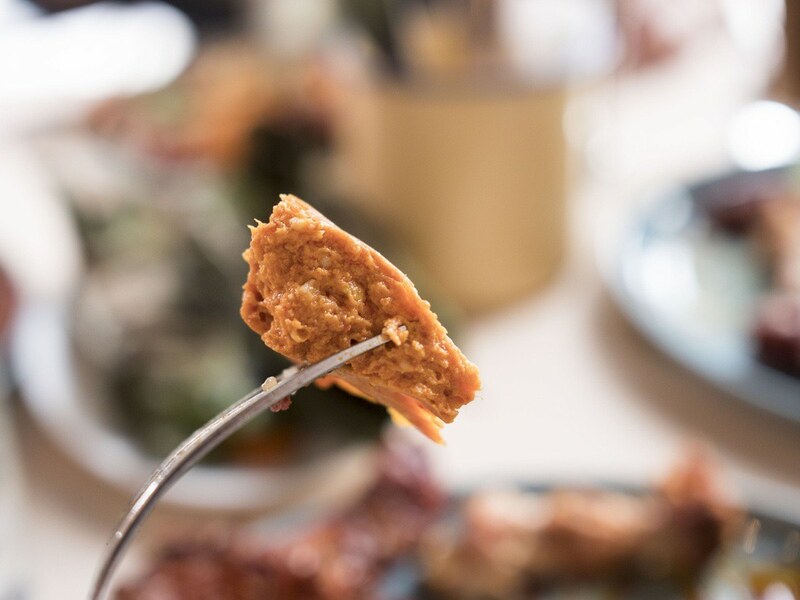 Instead, the fried chicken at The Coconut Club was covered with crispy deep fried rempah (spice mix). 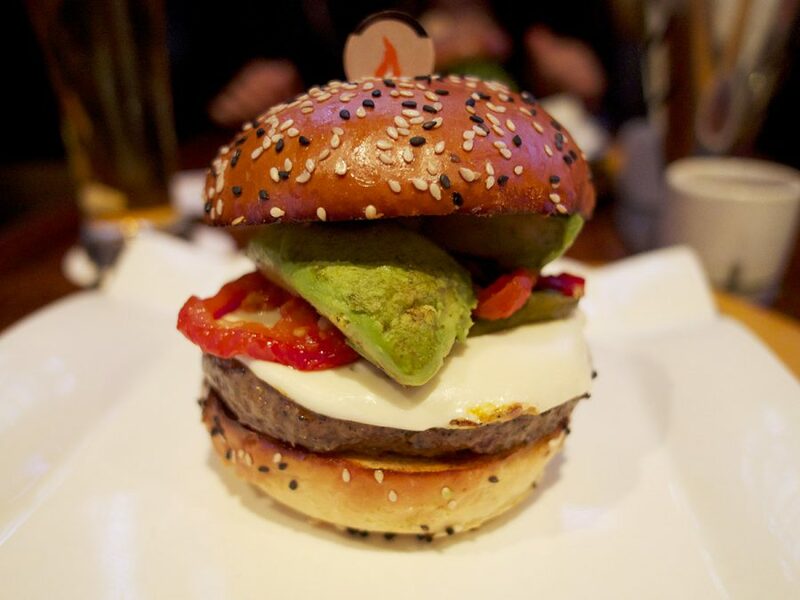 The skin was lightly crisp and very flavourful, as was the moist and tender flesh within. 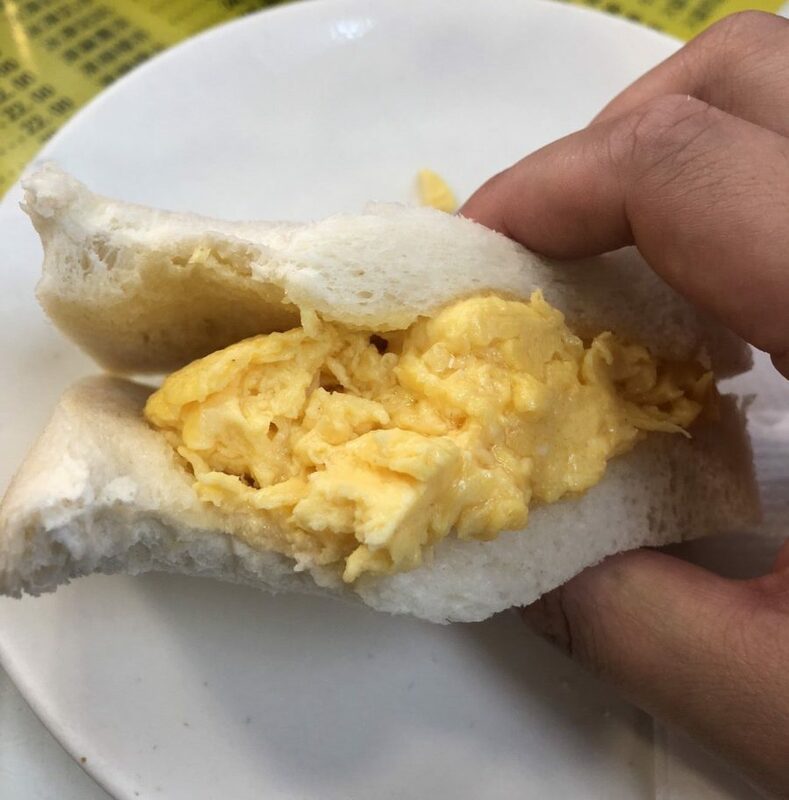 I suspect this was done in a similar fashion as shrimp paste chicken, where the chicken is marinated overnight in a spiced corn starch mixture to velvetize and flavour the chicken before being dropped into the fryer as it is. An entire chicken leg is given, which is in my opinion, the best part of the chicken to eat. All in all, I give the fabled nasi lemak at The Coconut Club a 8.5/10 which makes it good, but not life changing. Barbecued fish in banana leaves for $10.50 each. I was very curious to try their artisanal Otak Otak, especially when I saw that the price was $10.50 each, I was keen to learn what special techniques or fish they had used. 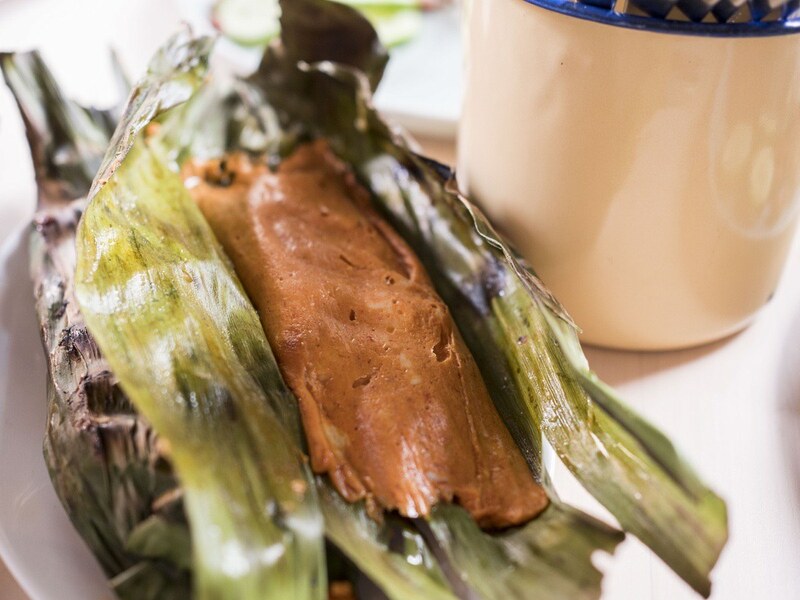 An Otak Otak is a malay dish similar to a mexican Tamale, except with fish and spices and grilled over charcoal instead of steamed. Sadly, the Otak Otak was not much bigger than your usual $1.50 otak otak and had neither the requisite charred banana leaf flavours nor a very pronounced spice profile. Yet even those drawbacks were dwarfed by the otak otak’s texture, a wet, mushy mash with little chunks of rigid fish within. Somehow this bundle of disappointment cost nearly the price of an entire plate of Nasi Lemak. Why? How? I can’t give more than a 2/10 because there were truly no redeeming qualities in their Otak Otak. Cendol sans red beans. I preferred it as simple as possible to enjoy the flavours of the coconut milk. Thankfully the Cendol was where the artisanal coconut milk got to shine. The coconut milk’s flavour was really apparent this time in the Cendol, despite being diluted with shaved ice, or perhaps it was shaved frozen coconut milk. Regardless, it was creamy and full of that umami kick that thick coconut milk exudes. 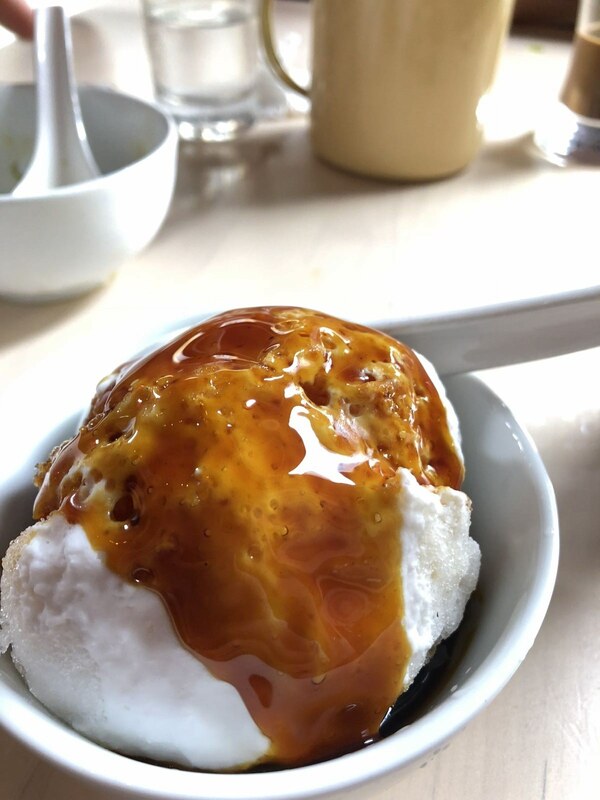 The gula melaka (palm sugar) syrup was rich and velvety, and paired with the coconut milk very well, but we all knew that already, given that this is a traditional dessert. Which sauce is better? Artisanal or Nostalgic? So while the folks at The Coconut Club gone through all that trouble to procure an artisanal coconut milk for their modern artisan nasi lemak, it didn’t manage to outshine all (or most) other nasi lemaks in Singapore, merely adding itself into their ranks. From what I had read online, many other reviews / foodies / media outlets also felt the same way about The Coconut Club’s nasi lemak. So that said, is artisanal self-made always better? Being a foodie, chef and ex-restaurateur myself, I have come to terms with that fact that in fact, self-made is not always tastier. Is it better, sure, since you have total control of the hygiene and quality aspects. However, certain things, for example tomato sauce (not ketchup), canned is actually better than freshly made tomato sauce. In this case, canned San Marzano tomatoes are more flavourful than fresh pureed tomato sauce. *source My Italian chefs friends and restaurants use canned tomatoes all the time. But I digress, back to the topic of The Coconut Club. Is artisanal coconut milk tastier than normal fresh coconut milk or pre-made coconut cream as many of us are used to having? Not much of a difference in terms of taste apparently, but way more effort and cost. Which makes it kind-of-not-better. Many of us have a nostalgic taste reference for a food like Nasi Lemak which we grew up eating. That nostalgic less-artisanal taste will often be favoured more than a new-age artisanal taste. As the saying goes, nostalgia is the best sauce. 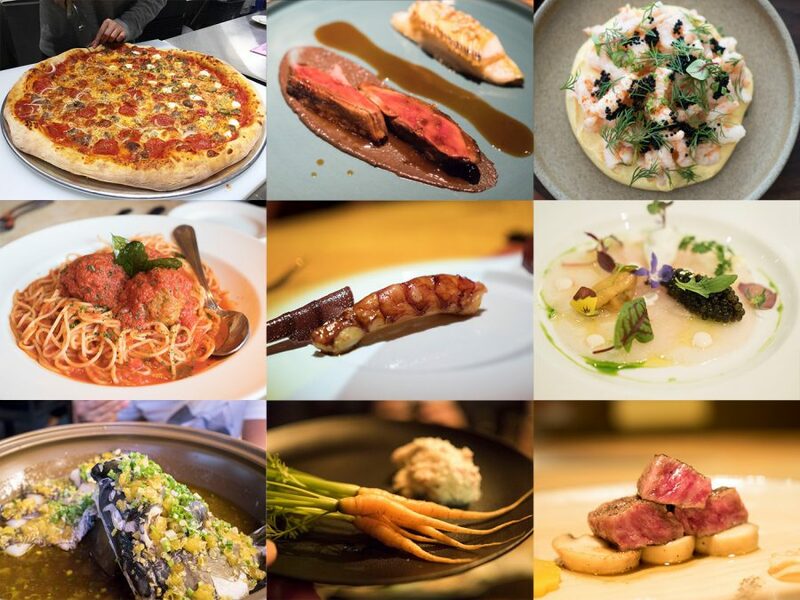 The Coconut Club is a remarkable and commendable effort at bringing local dishes to a new and more sustainable level. Their popularity after 2 years, speaks volumes of their success which is a good thing. 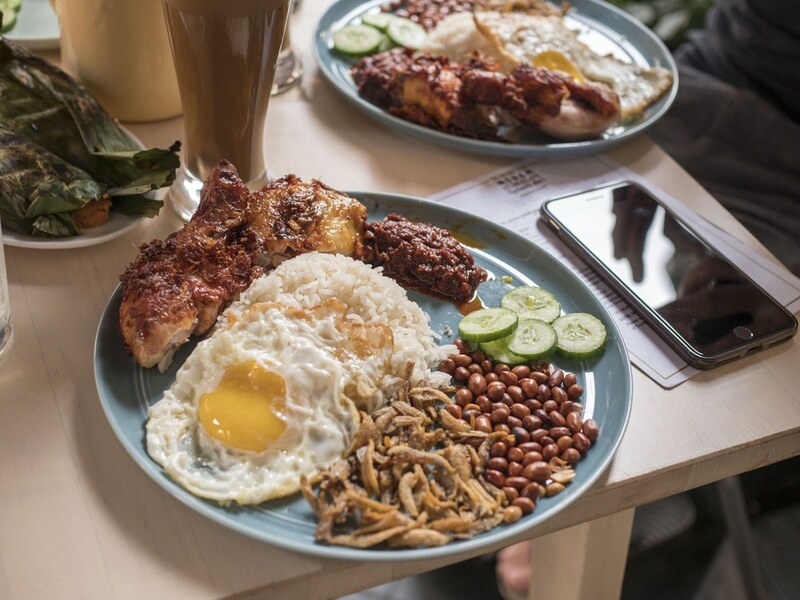 However, there are many other cheaper and equally if not tastier Nasi Lemak alternatives elsewhere at coffee shops and hawker centers, so they are by no means ‘the best Nasi Lemak in Singapore’. 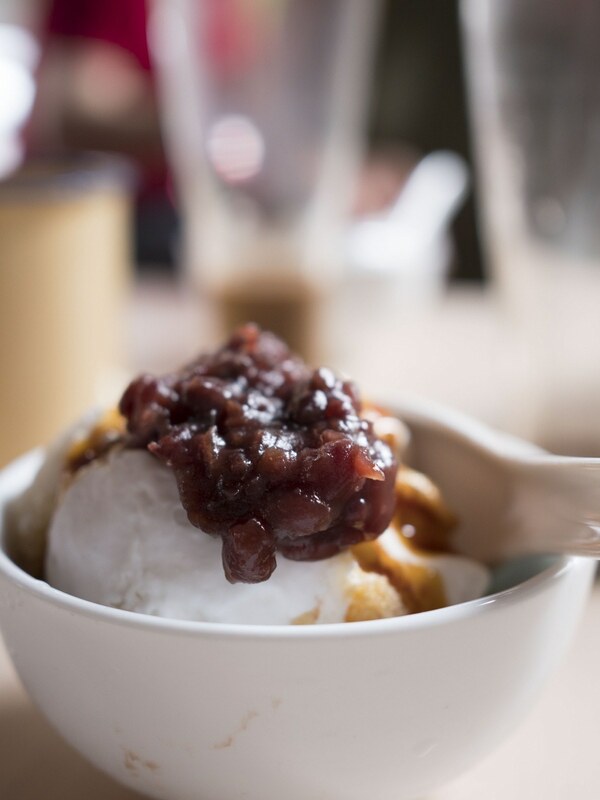 The Cendol at The Coconut Club on the other hand, is a force to be reckoned with, and I highly encourage you to try it out to taste the effort they had put into sourcing their exclusive MAWA coconuts.